Ever been in a situation where you had difficulty planning an outing purely because of the extremely large number of options available? Then, StrollUp is the answer to your outing planning problems. We had an informal chat with Abhishek Goel, the co-founder of StrollUp, where we got to know more about StrollUp and the facilities offered by them. Read on to know more about StrollUp! StrollUp provides you a way to find best activities and places for your big or small outings in your local city. What is the concept of StrollUp? StrollUp is working to solve the problems that you face when you want to go on an outing in an urban city, where the options are insanely high. StrollUp lets you find places/activities without the hassle of reading multiple blogs or visiting half a dozen websites.You can create an outing plan in no time, share your plan with friends and save your memorable outings. How many people make up the team of StrollUp? 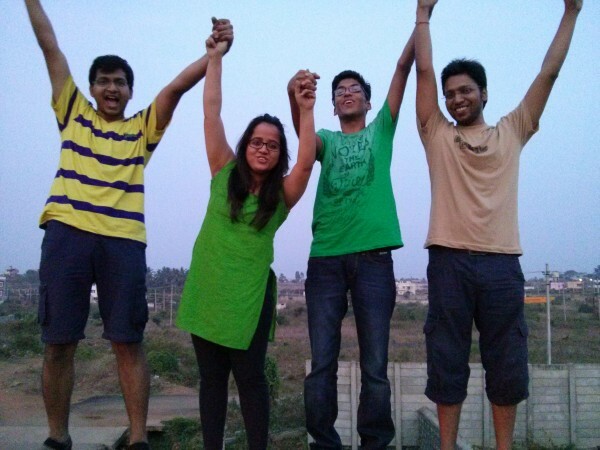 We are a small team with 4 co-founders (Abhishek Goel, Ankur Gupta, Siddharth Kumar and Prerna Singhal) and 3 interns. We also work with few freelancers. How do people access the facilities of StrollUp? Anyone can create an outing plan in few steps, on our website. They would get 15 recommended plans out of more than 10k options based on their preferences. These plans would have all details such as directions, cost, timings, address, photos, reviews etc. We also have a hangout catalogue for frequent user searches and upcoming festivals/events. For eg, for couples we created a romantic outings and for busy service people we created weekday evening plans. We keep adding such theme based plans for people in hurry. Other than our website, we also entertain people via email and call. We are also working on our mobile application after receiving a lot of requests from our users. Who is your typical audience base? How do you reach out to them? Our primary audience base is college students and service class people in their 20s and early 30s, who live in metro cities. We reach out to them via advertisements, social media, and sometimes offline stalls. In which cities can people make use of the facilities provided by StrollUp? What was one major challenge you faced when starting StrollUp? I think, this is the reason it took us 9 months to launch our MVP. One by one, we started leaving our jobs and relocated to Delhi. Fortunately, very soon, all co-founders would be in Delhi working full time on StrollUp. Where do you see StrollUp 5 years down the line? 5 years down the line, we see everyone using StrollUp whenever they want to go for an outing. StrollUp would learn more and more about you and start suggesting very personalized outing plans. By use, we don’t mean just finding places, it would find when you have free time, it would tell you who among your friends is free, it would tell you about happening things to do in the city. You could chat with them using strollUp, book your venue and rides using StrollUp, pay your bill and divide the expenses using StrollUp. What would you advise aspiring and budding entrepreneurs? Startup is not a part-time thing. You can’t do it part-time. If you want to do it, get full time involved with it. The next time you want to plan an outing, remember to check StrollUp and do not forget to like StrollUp on Facebook. You can even follow StrollUp on Twitter. If you have any questions or thoughts you would like to share with Abhishek or us, please do leave us a comment below.